Local watersports company hosts turtle tagging expeditions. This is one of the turtles caught, measured and tagged during a recent outing with SURFside Ocean Academy, who raises funds for the Marine Conservation Society’s TCI Turtle Project. 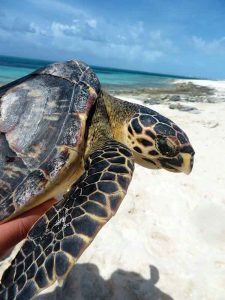 The Turks & Caicos Islands Turtle Project is working for better management of the marine turtle populations found in the TCI. Through groundbreaking biological and social research, this collaborative project aims to involve the TCI Government and fishermen in the management and monitoring of the Islands’ traditional turtle fishery. The project also uses hi-tech satellite tagging of green and hawksbill turtles to follow their lives at sea to understand the full range of these highly migratory animals and to find out how best to protect them. Marine turtles have been swimming our oceans for at least 110 million years, but now man’s activities threaten turtle populations all over the world. All species of turtle are susceptible to accidental capture in fishing gear. Turtles become entangled in gill nets and fish traps set inshore close to the nesting beaches.Throughout their range, marine turtles are still hunted for their eggs, meat and shells. For example, marine turtles are still legally harvested for their meat in four of the five UK Overseas Territories in the Caribbean, where green and hawksbill turtles are particularly targeted. It is not known if these harvests are sustainable, but marine turtle nesting populations in these territories are critically low. In the tropics, wherever turtles lay their eggs there is a demand for them. In several Caribbean countries, raw turtle eggs are mixed with alcohol and drunk as an aphrodisiac. In many parts of the world, hawksbill turtles are targeted for the scales on their shells, which are used to make tortoiseshell. International trade in wild turtle products is banned by all the countries that have signed up to the Convention on International Trade in Endangered Species (CITES). Marine turtles depend on a variety of habitats at sea, as well as the all-important nesting beaches. Sadly, these same beaches are under pressure from development, especially from the tourism industry. If beach development is carried out insensitively it can lead to erosion of sand from the beach, as well as the disturbance of nesting female turtles through increased activity and light pollution. The same light pollution disorientates emerging hatchlings, making them head inland to artificial light sources rather than out to sea. Predicted sea-level rise resulting from climate change will lead to the inland movement of beaches, a process known as coastal squeeze. Vital turtle nesting habitat could be lost if nesting beaches are prevented from moving inland by any development or beach armouring behind them. Marine habitat can also be disturbed or destroyed by development and other human activities. For example, sea grass beds and coral reefs are particularly vulnerable to degradation if exposed to sewage effluent discharged into the sea, and can also be damaged by heavy boat traffic and extensive use by bathers, snorkelers and divers. Turtles can also be killed by entanglement in and ingestion of marine litter, such as discarded fishing gear, plastic bags and balloons. Turtles cannot digest plastic and if they eat enough to block their digestive tract they will die from starvation. Climate change will affect marine turtle populations in several ways. For example, turtle nesting beaches could be inundated if they are prevented from moving inland as a result of sea-level rise; foraging habitat such as tropical coral reefs and sea grass beds could die off as a result of sea-level rise, water temperature rise and the effects of increased storminess and rainfall. If we don’t act now to change the way we treat marine turtles and their habitat we may lose some populations forever. In Providenciales, SURFside Ocean Academy, led by Morgan Luker, partners with the DECR and the Marine Conservation Society (MCSUK) with regular turtle-tagging expeditions. The academy’s well-trained team of local guides and turtle specialists capture turtles to collect data, educate guests on sea turtle conservation and fishing practices in TCI, and release the turtles back to the ocean. The hawksbill sea turtle is a critically endangered species, but is legal to fish in TCI waters. Since 2009, MCSUK has attached satellite transmitters to 22 green and hawksbill turtles. Suzie, an adult green turtle, was the first turtle to be tagged by the project, and surprised everyone by taking an incredible 6,000 km round trip over nine months before her transmitter stopped sending data. Since 2011, MCSUK has focused on tracking sub-adult (“teenage”) green turtles. They have attached tags to 20 teenage turtles, and are tracking some of these animals now. SURFside Ocean Academy (www.surfsideoceanacademy.com) is an outdoor adventure company and licensed school with an emphasis on marine-based activities to help foster an appreciation for and better understanding of the environment, people and places of Turks & Caicos Islands.